"Napoleon wrote that the French Revolution was the result of three factors: the Seven Years War, the Dutch Netherlands, and the Affair of the Necklace." The Affair of the Necklace takes a fascinating story, one based on infamous historical events surrounding the impetus of the French Revolution, and runs with it, straight into a wall. Convinced that they were making an award-caliber film, the kind of period drama Oscar® loves, the filmmakers went about casting big name actors and pouring money into fancy production design and lavish costumes. Too bad none of them seem to have noticed that the script is ham-fisted and full of soap-opera plotting and ludicrous dialogue. Hilary Swank (an Oscar® winner herself) plays Jeanne de la Motte Valois. When she was a child, her father, a nobleman, was executed after criticizing the monarchy, his family stripped of their title and turned out into the streets. Jeanne's mother dies, and she grows up an orphan. She's taken in by a wealthy family, but she doesn't forget what her life could've been—what those in power took from her. She marries a philandering count to gain entrance into the royal court, bent on reclaiming her birthright. Jeanne is a fascinating character, and historical accounts paint her as quite the devious manipulator, a pathological liar and a con artist. The film takes the easy way out by lavishing attention on the traumas of her youth, filming her anguished reactions in slow motion and with operatic accompaniment. Indeed, she's painted throughout as the victim, one simply trying to right an injustice. This makes her an easy "in" for the audience unfamiliar with the highly affected world of the pre-Revolution French royalty, I suppose, but it takes away much of the mystery and three-dimensionality of her character. Jeanne meets a popular member of the court, the gigolo Retaux (Simon Baker), who agrees to school her in the ways of the aristocracy. He tells her she needs to find a benefactor, and they settle on the Cardinal of France, Louis de Rohan (Jonathan Pryce). She leads Rohan to believe that she holds sway with the Queen, Marie Antoinette, whose approval he requires if he wishes to become Bishop. She convinces him to purchase for her, as a gift, an extravagant 2800-karet diamond necklace, promising to deliver it to Her Majesty. She then abruptly sells it and uses the money to buy her family chateau. Spelled out, the plot sounds interesting enough. The fallout for Jeanne's actions will clearly be quite severe. She's set the church and the crown against each other, in a time when tensions were already high, the populace on the edge of revolt. But her story lurches forward in fits and starts, sidetracked by scenes of her conspirators giggling through court functions and scenes of Rohan's sexual indulgences. At least Pryce seems to relish the perversity of his role—he pushes Rohan's repulsive tendencies to the limit, leering at every woman onscreen with lustful glee, going as far over the top as he did as a Bond villain. Similarly amusing is Christopher Walken in a small role as a mysterious seer who advises the Cardinal. But Swank, horribly miscast, stifles her natural, bubbly charms (visible even in her tortured portrayal of Brandon Teena in Boys Don't Cry) and plays Jeanne as tortured and dignified, and more or less humorless. She is somewhat limited by the role as written, of course, but she just seems uncomfortable in corset and voluminous ball gown. Speaking of costumes, they are wonderfully done, as are all technical aspects of the film. The production design revels in the ornate locals of Revolutionary France, and the cinematography frequently and beautifully captures the lavish locales. But Charles Shyer, who has directed mostly fluffy romantic comedies in the past (Father of the Bride, Baby Boom), can't quite find the right tone. Scenes either run too long and are boring, or they ramp up the drama to melodramatic proportions (made worse by the fact that, save Pryce and Walken, the actors all seem to think the movie is sure to win a plethora of awards). The dime-store novel dialogue, full of double-entendres and clichés actually turns out to be the saving grace, in a way. It, coupled with the awkward acting and inconsistent tone, serves to steer the film into the guilty pleasure territory. I must say, despite its faults, The Affair of the Necklace is consistently entertaining, if for all the wrong reasons. Image Transfer Review: This is a very nice transfer from the folks at Warner, who can usually be relied on to deliver very fine work. Colors are suitably rich and saturated, capturing the film's lush color palette quite well. I noticed no artifacting or aliasing, though halos from edge enhancement are occasionally visible. Darker sequences are a weak point; blacks are deep but shadow detail is lacking, leaving nighttime sequences somewhat difficult to make out. Still, this is quite a nice presentation of a well shot film. Audio Transfer Review: The DD 5.1 track (the only option included�no support for other languages is present) suits the film fairly well, but it's somewhat inconsistent. Dialogue, at least, is always crystal clear and anchored in the center channel, though there is some bleed into the front mains. Sound effects are well presented, occasionally with directionality across the front soundstage, but whenever effects are mixed to the surround channels, the effect is quite distracting, as front to rear imaging is rather poor. The score is spread across the front soundstage and sounds nice and full, but it too can distract when it is mixed too prominently into the rear channels (though this is only a problem in a few scenes). Extras Review: For a film that bombed at the box office, Warner has put quite a bit of effort into the DVD, producing a number of interesting featurettes that actually manage to avoid promotional fluff. First up, though, is a commentary from director Charles Shyer. It's actually much better than I was expecting, mostly because Shyer is not totally in love with his film. As with most tracks, we get the usual production anecdotes, discussions of the story and casting, and information about the technical side of the shoot. But Shyer is also frequently critical of choices he made, both in shaping the narrative in the editing process and in establishing the tone of a particular scene. It's off-putting to hear a director do nothing but talk about how wonderful the movie is when the film bombed with audiences (like Battlefield Earth, for example), and the track here provided a welcome change. Two featurettes are included, offering a look at the technical side of creating a period drama. Designing Affair is a 15-minute piece that explores the creation of the film's elaborate costumes. Interviews with designer Milena Canonero, an Oscar® winner, take us through the process of conceiving of, and creating, the costumes that have to be worn by extras appearing onscreen for less than a minute. This piece also includes comments from production designer Alex McDowell. The other piece also runs 15 minutes. It's a more typical behind-the-scenes affair, with comments from the cast and crew. Happily, they shy away from praising one another's skills or describing the plot to focus on the historical context of the story. Some good production footage provides a look at the director scurrying to get a shot in the can while filming at historical landmark, and making sacrifices due to time constraints. Five deleted scenes are provided in widescreen, look rather messy, and can be watched with optional director commentary. All of the scenes are simply excised narrative padding, and none would add much to the final film. Shyer explains his rational for cutting them well enough, even two he felt he should have kept. The included Gag Reel runs about five minutes, but includes only a few gaffs worth a laugh. Odd to see such a goofy extra to go with such a "serious" drama. Rounding out the disc are some brief filmographies for the stars and the film's theatrical trailer. I was sad to see that the cool teaser was left off the DVD. It featured no dialogue, only a funky operatic riff from Alanis Morrisette, and it showed off the beautiful cinematography quite well. 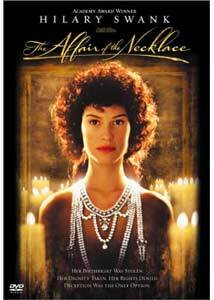 Maybe The Affair of the Necklace would play better as a silent film? The Affair of the Necklace shoots for high drama ala Dangerous Liaisons, but it doesn't quite hit the mark; the final film feels like a trashy, melodramatic soap opera (albeit one with excellent production values). It's actually quite a bit of fun, once you get over the fact that it's not a good movie. That's why they call it camp value, after all.